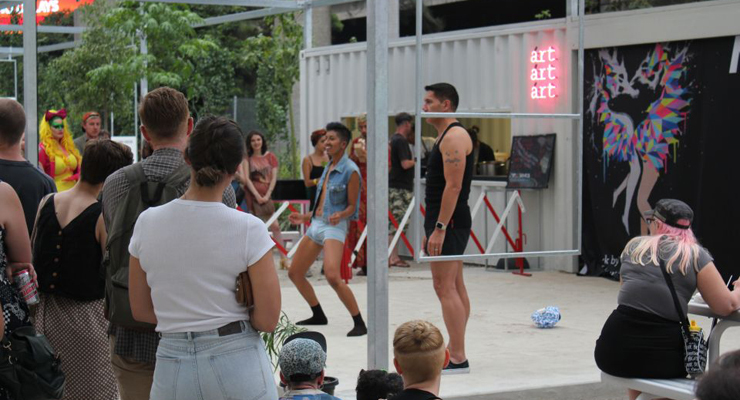 Tucked away between the Arts Centre and the Australian Ballet Centre in Melbourne's Southbank, the experimental arts space Testing Grounds has levelled up. Once home to the largest YMCA in the Southern Hemisphere, the 1 City Road site has been owned by the Victorian Government since the 1980s when the construction of the nearby Arts Centre was underway. For decades, the site sat as a dusty, empty lot. Managed by Creative Victoria, the site is the only vacant parcel of land in the area and is slated for development at some point in the future. In the meantime, it has been transformed it into an urban design experiment - a low-cost arts incubator and a make-shift public park. Established in late 2013, Testing Grounds' first incarnation was lovingly nicknamed 'Rancho Collapso' by the space's coordinators who worked out of a shipping container, powered the lighting using car batteries and ran an intense program of activities that took place amongst reclaimed pallets and garden planters. The space closed for renovation in May 2016, reopening the following November with a new look - and more covered spaces - and a renewed focus on unique programming. The idea for Testing Grounds came from a public consultation around the Melbourne Arts Precinct - the area just south of the city centre that is home to a remarkable concentration of galleries, performance spaces and elite arts training institutions. When asked what was missing from the area, people consistently identified a need for more public spaces, more cheap places to eat and drink, and places for more informal and exploratory work. "When you come into the arts precinct as a performer, it generally means you're at the peak of your career," says Bree Trevena, who led the project at Creative Victoria. "Testing Grounds is about providing access to people who are perhaps at the start of their career, and audiences who might want a bit of that grittier 'Melbourne' flavour." Testing Grounds was established at very low cost – Creative Victoria allocated the same budget that had previously been set aside for weed killing and rubbish removal to the launch and operation of the site. Designed and operated by partners Millie Cattlin and Joe Norster of Melbourne-based design studio These Are The Projects We Do Together, Testing Grounds has effectively become a living research model, testing in real time whether public use of the site reflects what the public said it wanted. Millie is an architect and designer while Joe has a background in theatre, lighting, production design and public art. Together they have crafted a space that is not only a place to create and present great art, it's also somewhere the community can gather, have a drink, grab a snack or just hang out. The engagement, on all fronts, has been truly exceptional. Hundreds of projects and events have been hosted on the site since its inception, with the vast majority being free to the public. During the Rancho Collapso era, the focus was on volume – programming as many events, exhibitions, workshops and other activities as possible in order to gather data on what works in the space and what doesn't. Now in its fourth year, Testing Grounds has proof that the concept works and the coordinators are looking to refine the programming. "Now that this extra infrastructure is here there's a lot more to consider, because it's not just an empty slate anymore," says Program Manager Arie Rain Glorie. "We want to raise the bar of the quality of work." Key to this is the idea that Testing Grounds is a unique space, with a focus on work that is site-responsive. "One of the first questions we ask is, why here?" says Joe. "Is there something specific about this site, this location, these facilities, that allows you to do [this project], that wouldn't allow it anywhere else?" The renovation of Testing Grounds, funded by the Victorian Government through Creative Victoria, saw the rustic wooden pallets swept aside to make way for a design that is far more structured, but still largely open to the elements. A steel frame marks out the boundaries of the space, and a series of interconnected beams, reminiscent of a Meccano set, provides endless possibilities for reconfiguration. The site also now features three enclosed sheds that can be used as exhibition or performance spaces, or studios for artists in residence. Millie and Joe once again created the design, inspired by British architect Cedric Price's Fun Palace project – a flexible theatre space designed in the 1960s that could be dismantled and reconfigured to suit different projects. "It's this idea of an endlessly manipulable kind of space," says Joe. "We pay homage to [Price's] idea in a lot of respects, in that you can grab, and clip, and hold, and drill, and plug." While Price's vision was so radical for the time it was never actually built, Testing Grounds is now standing strong, and building on the lessons of the past. The upgrade has also come with additional funding for staff, allowing Arie and Operations Manager Trent Griffiths to join the team. While the surrounding arts venues might be programming up to five years ahead, the flexibility of the space, and the rolling expression of interest process, mean that projects can go from application to installation in as little as a week. But artists who are self-reliant will get the best out of the site. "We support artists, but we can't necessarily guarantee we're going to be there to help them hang all of their work and stuff like that," says Trent. "It actually forces a lot of artists to problem solve in ways they might not have done in the past, particularly with a site that is temperamental at times." Central to the Testing Grounds concept is the notion of experimentation, and no experiment is complete without a set of research outcomes. The team has a rigorous approach to data collection, from the application process through to acquittal, and this information is funnelled continuously to Creative Victoria through an online portal. Creative Victoria can then use this data to better understand the needs of the Precinct. "We collect data from every single application and every single event that happens on site, and some of it is qualitative, and that's based on our observations," says Trent. "Arie and I are on site every day that we're open, so we get to see how people are engaging with the work, and what works and doesn't work from our perspective." In addition to a digital repository of data, the team also keeps a card file of handwritten anecdotes collected day to day. For example, one afternoon a group of RMIT students were struggling to hang some hammocks, when the Arts Centre's head rigger, who was there having an after work drink, interrupted them to show them how to correctly tie a knot. "They spent 20 minutes just talking and cross-pollinating ideas," says Trent. "One of the reasons it's called Testing Grounds is the notion of a site that allows for banging things up against each other," says Joe. "How do you put a program or a practice onto a site like this and test the limits of what it's trying to do? Every so often you'll see something that's new, and I think recording that, and understanding that process is really important." Visit the Testing Grounds website for more information.